Ratings and reviews on VS Marketplace! 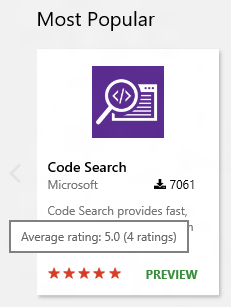 We’ve enabled a rating and review system on VS Marketplace for VSTS and VSCode extensions. Until now, download count of an extension served as a proxy for estimating the quality of an extension but no more! You can see a 5 star rating on the extension on the marketplace homepage. 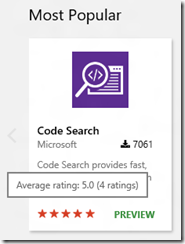 Note that rating and review was already available for Visual Studio extensions. This enables it for VSTS and VS Code extensions as well. 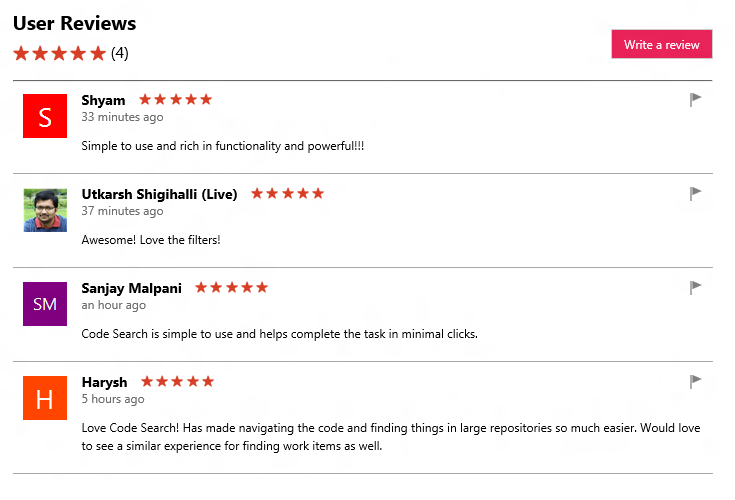 Hovering over the stars shows you the exact rating and the number of people who have rated this extension. 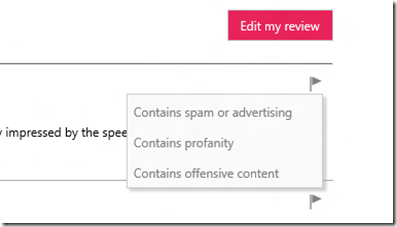 The name and picture you set here will be used in the review details section. So you have the control to change this anytime. You need to provide a rating, that’s mandatory. The submit button will be disabled until you select a rating. 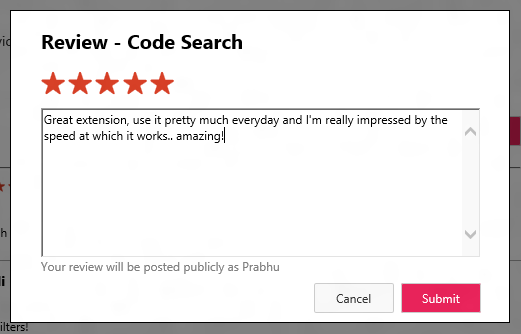 The review comment is optional and you can choose not to enter any text, though I recommend entering the text as it helps the developer get more details out of the review and figure out what you like/dislike about the extension. 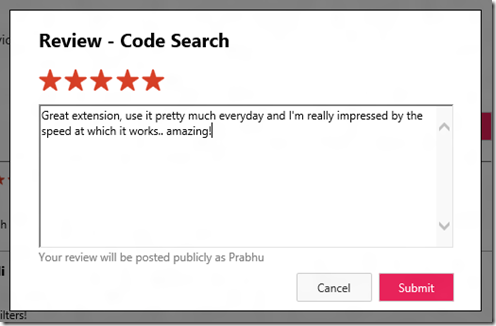 After you provide a rating and review comment, click on ‘submit’ and your review will magically appear in the details section! 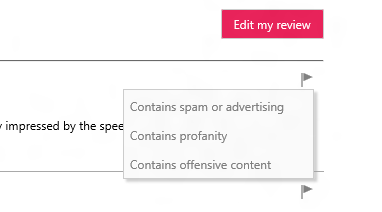 You can select the most relevant option while reporting a review. Our team will run through the reported reviews and take appropriate action based on the content of the review. That’s it for now, stay tuned for more! A festive feel for the 404 page? Today was my last day at Samsung. I completed 3 years there this July. My next job takes me to a new city and my domain takes a 180 degree turn from device drivers and firmware to something more related to the web. 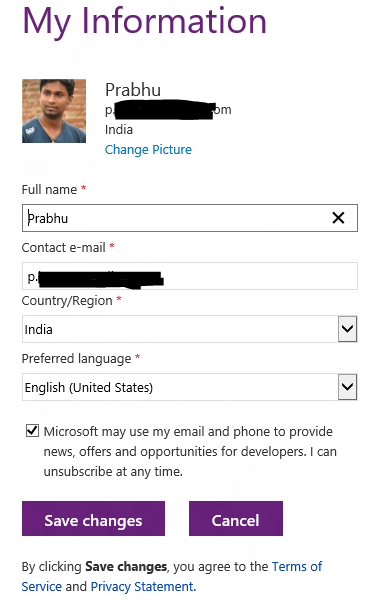 I will be joining Microsoft, Hyderabad as an SDET in the Bing team. Next monday, 12th September, will be my first day at Microsoft. I’m really excited and I know there is a ton of things for me to learn. Really looking forward to this! This is going to be a quick post. Just over 2 weeks ago I got the Windows Phone Mango invite I was waiting for; my HD7 has been running mango in full glory since then. The installation took a long time but went pretty smoothly, backing the data up takes most of the time. I am really liking the Mango update, this is what windows phone should have been when it launched. 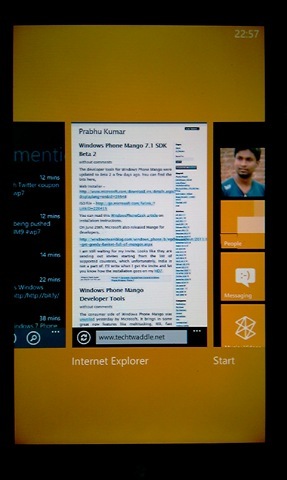 Multitasking, IE9, better facebook integration in people’s hub and a plethora of other features. The voice command integration in mango is exceptional, and I find myself using it quite often. Being able to listen to an incoming message, compose a reply and send it, all using only your voice, is really amazing (or magical, as some might call it) and works really well. Strangely, I am not using the multitasking feature all that much. Somehow I have an obsessive compulsion to keep the backstack clean all the time. Whenever I am done using the phone, I keep pressing the back button just to make sure there is nothing on the stack. I have a feeling I’m not alone. You can read this WindowsPhoneGeek article on installation instructions. I am still waiting for my invite. Looks like they are sending out invites starting from the list of supported countries, which unfortunately, India is not a part of. I’ll write when I get the invite and let you know how the installation goes on my HD7. The consumer side of Windows Phone Mango was unveiled yesterday by Microsoft. It brings in some great new features like multitasking, IE9, fast application switching, maps, web marketplace etc to name a few. I was also impressed with enhancements to bing like local scout, bing vision and bing voice. With the NoDo update fiasco now behind us, I think the expectations are set just right for the ‘mango’ update which will be coming this fall ;) One thing that annoys me is the feature-market fragmentation that’s happening with Windows Phone. What’s the deal with making some features available only to a few markets! Just look at the way zune services and their features are split region-wise. It’s horrible and needs fixing. Nothing was mentioned about Microsoft’s ad framework, PubCenter, and its expansion plans. It’s been close to 8 months since windows phone came out and PubCenter has expanded its market by zero, zilch, nada! There were talks a while back that it will be made available in europe, I don’t know how that’s working out. Hey you, make it global already! And show us some pay-per-impression love. And remember to install Visual Studio 2010 SP1 first. 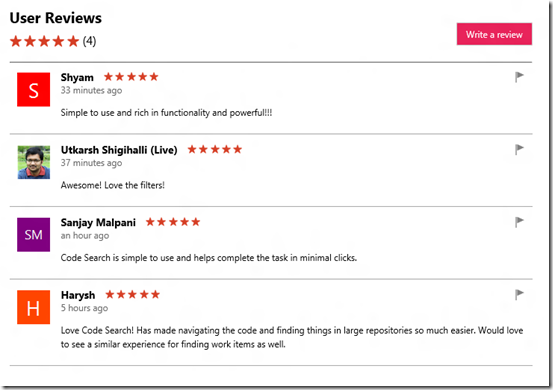 What’s New in the Windows Phone Developer Tools? 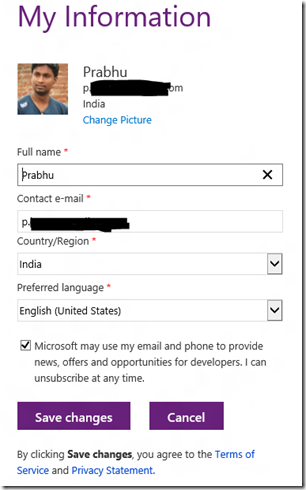 What’s New for Windows Phone Development with the XNA Framework? Like I mentioned in this post, if you installed the pre-NoDo update, the process would have required a fair amount of storage space on your primary drive depending on how much content you have on your phone. The Zune software takes a backup of your phone’s content before updating the OS on the device. This backed up data stays on your machine, here’s how to move the data to another location so you can free up some space on your primary drive. All the data is present inside the RestorePoint folder. Move this folder to another location to free up space. Make sure you keep this backup of the backup safe, just in case something horribly bad happens to your windows phone 7 device. A quick post, about two days back I got a notification on my HD7 saying that there is a update available to be installed. Yes, it was the pre-nodo update that you might have read about on the windows phone blog. Just installed it, and it completed without any hitch. Reading several reports about some devices having trouble installing the update (particularly the Samsung ones) and some even getting bricked, I was wary at first. I waited two days and there were no reports of issues with any of the HTC devices. I went ahead and installed it today. The only downside is that you might need a lot of space on your primary drive, close to 8GB for me, depending on how much data your phone contains. The update process backs up all the data in your phone, just in case something goes horribly wrong. The whole process took about 45 minutes, majority of the time for data backup. The OS version was updated from 7.0.7004.0 to 7.0.7008.0. Now if we could just get the NoDo update. What happens when you delete all the start screen tiles? 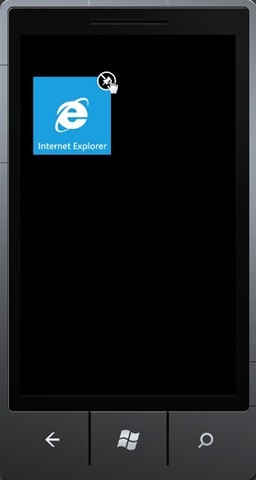 Well, the start screen disappears and all you see is the application list, which normally shows up when you scroll to the right. Pretty interesting I thought. So the start screen is basically a shortcuts screen on steroids, much nicer looking and with tile notifications.